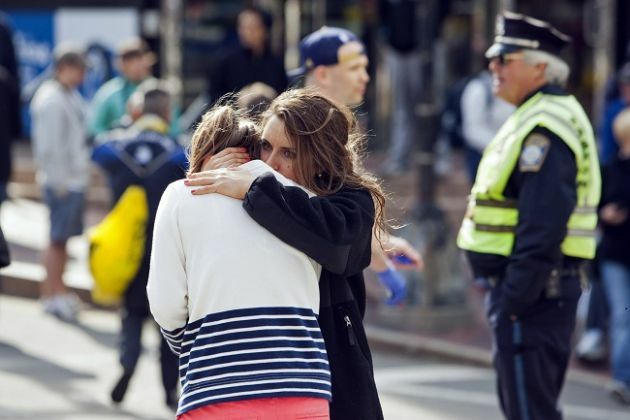 (Photo: Reuters / Dominick Reuter)A woman comforts another, who appears to have suffered an injury to her hand, after explosions interrupted the 117th Boston Marathon in Boston, Massachusetts April 15, 2013. Clergy from the Boston area and beyond offered prayers after explosions, deaths and injuries on Monday near the finish line of the city's marathon. Three people were killed and more than 100 people were injured after the downtown blasts, according to reports. Police had not announced the apprehension of any suspects or motives as of Monday evening. Rev. Nancy Taylor, senior minister of the United Church of Christ, along with another member of the church staff were steps away from the explosions at the denomination's Old South Church. "We have heard three loud explosions," Rev. Taylor said according to UCC News, a contrast with other reports of two explosions. "Many people were injured, but the church has not been damaged. The police have asked us to stay put for now. Praying, praying." A Boston area bishop from the United Methodist Church expressed grief over those who died or who were injured as well as their families and offered to pray with families of any church members injured in the attack. "In moments like this, we do not know what to say or how to say it, but will you join me in the prayer of the psalmist, 'God is our refuge and our strength, a very present help in times of trouble.' (Ps.46:1)." A prayer service has been tentatively scheduled in Old West Church, United Methodist in Boston on April 16 at 7 p.m. if people are permitted into the city, according to the Rev. LaTrelle Miller Easterling, Superintendent, Metro Boston Hope District. The Rev. Mark S. Hanson, presiding bishop of the Evangelical Lutheran Church in America posted a brief prayer on Twitter. "Loving God, for all in Boston who mourn the deaths of loved ones, who are injured and afraid we pray for your mercy and peace. In Jesus name," he wrote. The Roman Catholic Church's Archdiocese of Boston issued a statement via Twitter in the immediate aftermath of the explosions. "Please join us in prayer for all those injured at the Boston Marathon today and for the emergency workers who protect and care for us all. May our Risen Lord have mercy on us today," the Archdiocese wrote. Leaders of the Presbyterian Church U.S.A., including moderator Rev. Neal Presa, stated clerk Rev. Gradye Parsons and mission leader Rev. Linda Valentine issued a prayer focusing on God's refuge and strength. "Gracious Lord, you are our refuge and strength, our very present help in trouble. With sadness and questions in our hearts, your Spirit prompts us in this hour to pray for our sisters and brothers in the wake of the tragedy in Boston," wrote the leaders. The prayer also touched on the the person or people behind the bombing. "Pierce the heart and soul of the perpetrator(s) of this act of violence. Forgive that individual(s) for they know not what they do," the wrote. They pointed to worship resources on their website for use in times of disaster. The head of American Baptists Churches U.S.A., the Rev. Roy Medley condemned the acts. "These attacks are antithetical to God's will. There can never be a credible justification for any such act," Rev. Medley said. "We utterly condemn acts of violence and find them heinous and cowardly. Our hearts go out to the families of all the victims." The Rev. Katharine Jefferts Schori, presiding bishop of the Episcopal Church prayed that "the suffering and terrorized be surrounded by the incarnate presence of the crucified and risen one." "May our hearts be pierced with compassion for those who suffer, and for those who have inflicted this violence, for your love is the only healing balm we know," she said. Cardinal Sean O'Malley called the events "senseless acts of violence," in a statement. He said citizens of Boston were blessed by the leadership of the state's governor and city police chief to ensure public safety. "In the midst of the darkness of this tragedy we turn to the light of Jesus Christ, the light that was evident in the lives of people who immediately turned to help those in need today. We stand in solidarity with our ecumenical and interfaith colleagues in the commitment to witness the greater power of good in our society and to work together for healing," he wrote.